According to historical evidence, as well as the collective memory of the Church, Christianity has been present within Persia (Iran) from as early as the time of the Apostles. The reason for this, was that Persia was outside the control of the Roman Empire, and even posed a threat to it. Thus it was only natural that Christians who dwelt within the Roman Empire, would seek refuge within Persia far beyond the threat of Pagan and Jewish mobs or the Roman or Jewish authorities. Various kings of Persia encouraged many of these refugees to settle within their realm, and in general terms did not have any objections to Christianity being preached within their lands. This is not to say that there were no instances of prejudice or at times persecutions. Compared to what was occurring to the west, circumstances were far more favourable to openly practicing the Christian Faith. The foundation of the Christian communities in Persia consisted predominately of Syrians, Anatolian Greeks and Mesopotamians. Nevertheless this open door policy did not remain forever, because with the open acceptance of Christianity within the Roman world via Constantine’s Edict of Milan, and the subsequent Christianisation of Roman society, Christians in Persia thus became a subject for suspicion by Persian authorities. It was believed that Persian Christians would serve as spies and informants for the Roman (Byzantine) Empire and possibly pose a military threat within Persia. These events also coincided with the founding of a new imperial Persian dynasty, the Sassanians, who had sought to revive Zoroastrianism as the official state religion, bestowing many rights, entitlements and financial support to the priestly class and the religious establishment. Hence imperial unity and strength was built on religious as well as (to some extent) ethnic foundations. Other religions were barely tolerated, and Christianity, amongst others, was closely monitored and at times systematically purged through bouts of persecution. The magnitude and cruelty of these persecutions easily matched those that had occurred during the pagan era of the Roman Empire, and in some cases even exceeded the pagan Roman or Jewish excesses. This is partly due to the fact that Persia itself could, and nearly did follow a Christian path, thus Christianity posed as an alternative to Zoroastrianism, therefore posing as a threat. However, the form of Zoroastrianism which took shape during the Sassanian period, differed considerably from its ancient practices and customs. The imperial authorities encouraged the developments of mystical cults within Zoroastrianism whereby “magic” and “enchantments” would be practiced within secret rites. These were inspired by the post-Hellenistic developments of religious-philosophical brotherhoods which begin appearing all across the ancient world, spurring an era of syncretism and new rites within existing religions, often perverting the foundations on which existing religions were built on and creating new religions in the process. It is into this context our great spiritual athlete, Anastasios, was born into for there existed an uneasy relationship between the Christian Byzantine Empire on one hand, and the Zoroastrian Sassanian Persia on the other. These two great powers often coming into conflict with each from time to time, peace was usually an interruption of war, and the sporadic persecution of Persian Christians did not help this state of unease! The context into which Anastasios’ martyrdom takes place, was within another one of these long series of conflicts between Byzantium and Persia. The impetus occurred when the tyrannical Phocas assassinated Emperor Maurice and assumes the throne of Byzantium. The then king of Persia was Chosroes II who was a close ally of Maurice who had sheltered him during his time in exile, and it was Maurice who had served as a mentor and foster father to Chosroes, providing him the means to retake the Persian throne. However as Persian chroniclers also cite, that he was a tyrant in his own right, and seeing the removal of Maurice inflamed his thirst for revenge, as well as a pretext to break his treaty with Byzantium. The ensuing chaos that ensued witnessed many Byzantine defeats, whereby the Persians seized Palestine, Phonecia, Syria, Jordan and Egypt. Times were difficult given that the Monophysite controversy had been raging since the time of Justinian, the plague had wiped out one third of the population, recession, high taxation and the incessant wars with Persia had pushed people to breaking point. In spite of this the Persians exacted tribute out of these newly conquered people, plundering what they had, and desecrating many Christian Holy Sites, often stealing precious relics and liturgical items. Of particular importance, was the seizure of Patriarch Zosimos of Jerusalem and the Holy Cross, as a means to humiliate Christendom and taunting the Byzantines, even threatening to destroy all that they had acquired if any steps were taken against Persia. However for the Persians, the outcome of carrying off the Cross to Persia witnessed the Church of Persia to grow in leaps and bounds with an ever-increasing number of Persians seeking to learn about and even become Christians. Rather than humiliating the Christians, the Persian civil authorities and the priestly caste realised their folly and were compelled to take drastic actions against a grassroots movement that threatened to engulf Persia and turn it into a Christian nation. During this period of Byzantine setbacks, the military commander Heraclius, with the aid of the military, removed Phocas and set about re-establishing law and order, while setting upon the task of preparing a military campaign to defeat the Persians. During the interval before the Emperor Heraclius could finally go on his crusade, a systematic process of persecutions was enacted by Persian authorities that witnessed numerous martyrdoms in territories under their jurisdiction. Into these chain of events our blessed and holy martyr enters, but what marks him out, and his martyrdom as something unique, was that he was of the Persian nobility and priestly caste. His martyrdom was not imposed upon him like so many of the time, but was a personal desire to come close to Christ and to mock his fellow countrymen, highlighting the error of their ways in adhering to state created and imposed Zoroastrianism, as well as their persecution of Christianity and the desecration of its Holy sites. This fervour was so deeply implanted within him, that after his conversion he refused to speak in Persian ever-again, forcing Chosroes’ representative to make use of an interpreter. Yet what also marks out Anastasios’ martyrdom, is the duration of his trial and torments lasting almost some two years before he was finally martyred. From examining the various surviving manuscripts, it seems the “patience” and “tolerance” extended to him, was due to his noble and priestly upbringing. In one respect, there were certainly those amongst his former associates, like his family who would have held influential positions and may have had a hand in some sort of “clemency” being shown towards him. The other point was that by Anastasios’ example, the effect upon other members of the nobility and the priestly caste to become Christians was a grave threat, yet to prevent Anastasios acquiring sympathisers amongst the ruling class “clemency” and “patience” had to be shown. At the same time, it was also in the authorities’ interest to break him and force him to recant, so that others would not become Christians. Naturally due to his conversion and his ascetical struggles as a monk there was no way Anastasios was willing to concede. It is clear that he wanted his confession of faith to be one made before his compatriots. In any case, after Anastasios’ martyrdom, the persecution “officially” came to an end when Emperor Heraclius crushed the Persians in a series of battles and won the war to recapture the Cross of Christ and a reprieve for Persian Christians. A peace deal was signed with Chosroes’ son Kawad Sheroe, who executed his father, but the victory was short-lived because Arab-Muslims from Arabia had begun attacking both Byzantium and Persia. The centuries of warfare, plagues and economic problems had weakened Byzantium substantially, and virtually annihilated Persia as a powerful nation. Both became subject to the attacks of a determined, fanaticised and organised foe, which chose their moment to strike, since they would never have had an opportunity to win a war against either before or after. Thus the Arab-Muslims conquered much territory from the weakened Byzantines and absorbed and devastated Persia in all its entirety. For the Christians of Persia, and the Middle East in general, a new period of persecution (which continues right into our own times) descended upon the populace. Through political, economic and social coercion along with discriminatory taxation the populace were forcibly converted to Islam or martyred. The divide and conquer policy of Muslim rulers on Eastern and Oriental Orthodox exacerbated the situation which was compounded by the Crusaders massacring the local Christians, only to give the Muslims further propaganda to coerce or kill Middle Eastern Christians. Unfortunately this sad state of affairs is currently justified on the grounds that Middle Eastern Christians are viewed as agents of the West and enemies of Islam, and using them as the scapegoats for the real origins of the problems facing the region! 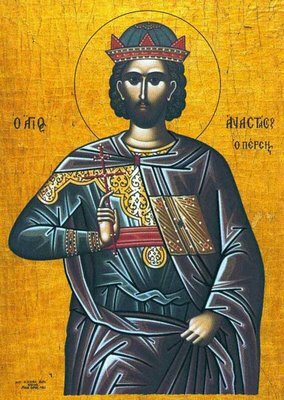 The glorious holy martyr Anastasios, a Persian by birth, lived during the reign of the Persian King Chosroes II (627 AD), when Heraclius was Emperor of Byzantium (610-641 AD). His original name was Magundat, and his father, Vav, was a priest-magician who thoroughly taught him the arts of magic. In any case, when Magundat came of age, as was the custom at that time, was subject to military service. Thus like many other young men of his age, was placed within a military division with other recruits. In 614 AD, the Persians had seized and plundered Jerusalem. The Persians carrying off with them all the various spoils of war, had also seized many holy and sacred articles from Palestine, particularly the wood of the Cross of Christ back to Persia. The Persians believed that by seizing the Cross they would not only humiliate the Christians both at home and within Byzantium, but in effect would have control over them, taunting Heraclius that they would destroy the Holy Cross if any action was taken against them. However this great weapon of salvation and invincible trophy, shone forth brilliantly in Persia bringing many of their fellow countrymen towards learning more about the captured treasure of the Christians and their Faith. Like many of his fellow countrymen at the time, Magundat the young soldier, when hearing about the seizure of the Cross by his king, also became curious about the Christian Faith. The opportunity arose for him, when he had the chance to behold the Holy Cross, and learning a few things about Christianity when it was being discussed. At that moment a secret and divine flame was ignited within Magundat’s soul. That spark of love began to grow in him overtime, and so he desired to learn more about this unique faith, like how God took on flesh, why He was crucified and so forth. Naturally this placed him on a quest to seek the answers his heart desired to know, and so he sought some pious Christians who could enlighten him about the mystery of Christ’s dispensation. He found such people who taught him as best as they could, and he received all that they said with an open heart and mind, and with great joy, and so the seed of faith multiplied within his heart. So great was the impression made upon his soul, that when he finally returned home from an expedition, he resolved to abandon his homeland, wealth, family and the military. Thus he retired to Hierapolis, where he sought and lodged with a devout Persian Christian who was a goldsmith. Magundat zealously pressed the goldsmith to have him baptised, for he desired to be cleansed of the vileness of the magical arts and become a blameless servant of Christ, sealed with the sign of the Cross. Nonetheless, the goldsmith hesitated to fulfill Magundat’s request, out of fear of the Persian idolaters. Undaunted, Magundat entered the local church to pray. Once inside, he was completely absorbed by the icons and asked about the lives of those who were depicted, for he was anxious to learn the accounts of their struggles and contests. All the while his heart was consumed with divine love, and thirsted to go to the very place where the works of salvations were fulfilled, and to be immersed in the life-giving waters of baptism in the Holy City of Jerusalem where his spiritual thirst besought to take him in order to be quenched. The journey to the Holy City was made easier for Magundat, in that being a Persian he could travel somewhat freely, since as noted before, Jerusalem and much of Greater Syria had been captured and occupied by the Persians. Some days after Magundat had reached Jerusalem, he met a Christian silversmith to whom he disclosed the purpose of his pilgrimage. The silversmith perceiving the young man’s sincerity brought him to Elias, who was the presbyter at the Church of the Resurrection (Anastasis). Elias then introduced the young Persian to Patriarch Modestus II (whose memory is honoured on 16th December), who joyfully received the youth and baptised him, naming him Anastasios. In baptism, his Persian name was thus changed from Magundat to that of Anastasios, to remind him, according to the meaning of the word in Greek, that now he had risen from death to a new and spiritual life. (Also, when he was brought to the laver of regeneration, a compatriot of his was also baptised with him. His name, unfortunately, is unknown to us, but what is known is that he was martyred in Edessa). After his baptism, Anastasios remained in the home of Elias for eight days, as was the custom then for the newly-illumined. The presbyter inquired as to what Anastasios intended to do, what plans he had for the future. In order to better fulfil his baptismal vows and obligations, Anastasios expressed the desire to be made a monk. Elias did not refuse Anastasios, for he perceived the nobility of the youth’s soul. Later, when the holy Elias finished celebrating the Divine Liturgy, he took Anastasios, and they went to the Monastery of St. Anastasios, which was approximately four stadia from the Holy City. The abbot of the monastery was the enlightened and virtuous Justin, who joyfully accepted the blessed youth into his company. Anastasios’ entry into the monastery occurred in the tenth year of the reign of Heraclius (620-621AD). In any case Anastasios was given to an elder, who directed him to study Greek and learn the Psalter by heart. In a short while, Anastasios fulfilled these obediences, and the abbot, noting the youth’s excellent and God-pleasing life, tonsured him to the monastic Schema. After this, Anastasios exemplified virtue and humility in all his labours. He was also meticulous and thorough in the two obediences that were assigned to him: gardening and cooking. He executed these two offices expertly, and, moreover, he was never absent from monastery gatherings or liturgical services, which he excelled in. Indeed it is said that Anastasios was the first to enter the church when the Divine Liturgy was to be served. Whenever he would hear the lives of the saints, his entire attention was completely focused on the readings; furthermore, he retained accurately all the accounts in his memory. If there was a difficult word that he did not know or understand, he would never tire of asking the others for the definitions. However, he would read privately, on his own, particularly the lives of the martyrs and their glorious accomplishments. The book that he was reading from was soaked with tears, and all the while, he, too, wished that he might be vouchsafed such an end. Therefore, he supplicated God for this blessed end that he might valiantly shed his blood for the love of Him. Anastasios dwelt in the brotherhood for seven years, which did not pass untroubled. During that time, the father of envy could not endure to witness Anastasios’ virtue, fervour and love of Christ. Whereby, the demon assailed him with all kinds of temptations and memories of his leisurely life in Persia, his father’s love, worldly pleasures and other such vanities. Moreover, the demon brought to his recollection the practices and superstitions which his father had taught him. Nevertheless, the wise youth understood all these suggestions and temptations to be demonically inspired. Wherefore, he would invoke the name of the Lord for sure assistance and then betook himself to his spiritual advisor and laid bare, with tears and a frank disclosure, his thoughts and the machinations of the perverse “dragon”. His confessor then summoned a gathering of the brethren who offered up supplicatory canon of prayer on behalf of their brother and, straightaway, the temptations departed. Shortly, thereafter, the thrice-blessed one beheld a vision. In the vision, he had ascended a lofty mountain that seemed suspended in air. When he reached the top, a man gave him a gold cup that was bedecked with precious stones filled with wine. He then said to Anastasios: “Take and drink this”. The blessed Anastasios partook of the wine, which he found to be exceedingly delicious and sensed a sweetness in his soul. Before he came out of the vision, he understood that the Lord was showing him his future martyrdom. However the elder replied: “How do you know that you will soon depart towards the Lord?” Anastasios then revealed the vision he had beheld and how he has perceived the cup to be death, of which he would soon partake. Whether it would be a death that is common to all or in a manner to his benefit, Anastasios said he did not know, for he did not reveal to his elder his intense desire for martyrdom, fearing that the elder may seek to dissuade or prevent him. Nevertheless after hearing these things the elder offered him encouragement, and then they celebrated the feast. After the Divine Liturgy, during which all the brethren communicated the All-Holy Mysteries, they all embraced in the refectory. When all had retired to their cells in the monastery, Anastasios was unable to sleep, being aflame with the zealous desire for martyrdom. Therefore, he secretly departed from the monastery without making provisions for food, money or clothing, apart from what he was wearing, and journeyed to the shrine of St George at Lydda (Diospolis), then to Gerazim and the holy places. He then went to Caesarea (Palestine) and, entered the Church of the Holy Theotokos, where he prayed for two days so that he could be directed to what was beneficial to his soul. After which, he proceeded towards the church of St Euphemia where, outside, he saw a magician from Persia who was plying his magical arts and enchantments. Anastasios knowing fully well the demonic nature of this illicit craft (which he had once practiced), was moved by divine zeal to sternly rebuke and censure the magician. The magician surprised by the monk’s audacity, enquired as to why he had been publicly derided him. Anastasios then explained how he himself had formerly been deceived by these questionable and irreligious practices, but, after learning of the True Faith in Christ, he was purified by Holy Baptism. Furthermore he cited how incensed he was by these practices which lead people astray into ignorance and superstitions. Anastasios continued in his discussion with the magician who held much of what he said in contempt, even attempting to convert Anastasios. Nevertheless, it happened that there were other Persians standing nearby, who were his former comrades-in-arms, who in ignorance of Anastasios’ identity, swiftly apprehended him like hungry wolves and threw him into jail. It was then decreed that Anastasios would be brought forward for examination before Marzabanes the governor, when time permitted for the case to be examined. Hence Anastasios spent three days in prison without eating, for he refused to consume the food offered him. Rather he found nourishment in his hope for the pending trials that he would face soon for Christ. Several pious people learned of his incarceration and visited him reverently referring to him as blessed, while offering their encouragement. They advised him not to cower before the trials of tortures or before death which would only usher in eternal life in the Kingdom of Heaven. When Marzabanes was ready to hear his case, Anastasios was brought in. However, the monk did not show obeisance to the governor, which was the Persian custom, but stood straight without a trace of fear, showing an unsubjected soul. Then, glaring with an angry countenance at Anastasios, Marzabanes inquired about the prisoner’s identity. Anastasios then began to relate, in detail, everything concerning his Persian birth, former beliefs and his conversion to Christianity. The governor then, by flattery, attempted to change Anastasios’ mind, promising him the perishable and vain things of the world. Anastasios did not respond to the governor’s entreaties, but instead looked up to heaven and said: “May it never be, Christ the King, that I deny You!” The governor then ordered that the holy prisoner be bound with an iron chain to be attached from his neck to one foot. He was then condemned to lift and carry rocks for the building of the fortress wall, (since the Persians were still rebuilding much of what they had destroyed in their wars against Emperor Heraclius). Some of Anastasios’ former acquaintances and compatriots were present, and they questioned him as to why he had spurned their beliefs saying things like: “Why did you insult your former noble people and why have you become a contemptible Christian, only to be bound as a captive criminal, to the shame of your people, mindless one”? This and many other comments were made by his compatriots who then ceased enquiring about his life choices and began to strike and beat him. After a few days, he was brought again to be examined by Marzabanes who attempted to dissuade him from remaining as a Christian, by threatening to send him to Persia whereby the king himself would examine him and issue tortures much greater and violent upon him. Anastasios, nevertheless, remained steadfast and unmoved, he simply said: “Write whatever pleases you. I am a Christian, and I repeat, I am a Christian”. Marzabanes then ordered the prisoner to be beaten without mercy. The executioners were preparing to bind him on the ground, but the saint declared: “I will remain myself and bravely endure the strokes, for just as the man who, during the harvest, is driven by thirst and desires to quench his thirst with cool water, so do I desire even more -– unworthy though I be for my Christ -– to receive the most bitter and harshest death!” The saint then begged leave to put off his monk’s habit, lest it should be treated with contempt, which he felt only his body deserved. Having removed his outer garment, he stretched himself on the ground and, with great courage of soul, endured the beating with clubs. Without holding on to anyone or anything, he did not stir but remained immovable. The marvellous athlete of Christ, in the midst of bitter and unbearable bodily pains, was consoled only by divine love and sustained by the hope of future blessedness. Once again, Anastasios was brought before the senseless governor who reiterated his threat to send him to the king for worse tortures because of his obstinacy. However the wise one answered: “The king is a man subject to corruption just as we are subject, and he will die either today or tomorrow. Therefore there is no need to fear him. He Whom we need tremble before, is the heavenly and everlasting King, Who made all things, visible and invisible”. The tyrant then commanded the prisoner return to the dungeon, since Marzabanes still held out the hope that Anastasios would change his mind. Therefore after a few days, Anastasios was brought before the governor again, who demanded that he make sacrifice to fire, since this was the Persian belief and custom. Anastasios answered: “To offer sacrifice to the fire, the sun, the moon and the horse…what ignorance! Why do you not order me to prostrate myself before the mountains and cattle or any created thing, miserable one? It is God Who has placed man at the head of his creations that they might be subject to him. God is the only King to honour”. Anastasios said many other things which rendered the tyrant speechless, and so Anastasios was sent back to prison. Meanwhile, his elder and teacher, Justin, at the Monastery of St Anastasios, learned of his disciple’s boldness in rebuking the tyrant and how he had undergone with great courage and steadfastness the torments inflicted upon him. The elder was filled with holy joy over his disciple’s victories in the face of adversity, thus he summoned all the brethren to offer supplicatory prayers on behalf of Anastasios, petitioning God to empower and sustain him in his struggle against the tyrant, so that he may vanquish him and attain the crown of victory. Furthermore the elder instructed that two of the brothers would go and deliver letters to Anastasios which exhorted him to continue his struggle, to take strength in their prayers and to not fear the trials of the tyrant, for he will end what he began in the same courageous manner. Some days elapsed, and Anastasios was still incarcerated, yet he did not cease in reciting his rule of prayer even for one night, in spite of the difficulties of being bound by neck and feet to a felon who shared the same cell with him. Anastasios achieved this by not standing up completely with his head bowed downwards, keeping his chained foot near his companion so as not to disturb him at night, despite the immense difficulty and discomfort to himself. One evening, as Anastasios chanted, the jailer, who was a Jew heard him. He was a good-willed man who noticed how Anastasios toiled all day conveying rocks and spent the greater part of the night in prayer, and the jailer marvelled at how the prisoner did not tire. He decided to go and have a look at the prisoner, so he peeked through an opening of the cell, only to see a most astonishing sight. He beheld in the cell a certain one who was enveloped in a white garment, resembling the stole of a bishop, who shone brilliantly like the sun. Anastasios was similarly dressed, and standing next to him was a splendid youth, resembling a hierodeacon, who was censing Anastasios. The jailer was in utter amazement and wanted to go and bring a companion of his who was a Christian from Scythopolis, but from his great surprise, he was unable to move his hands or feet. (By divine condescension was the unbaptised one permitted to see such a vision, so that he might reveal it). Finally he forced himself and brought one that was nearby to share with him what he had seen, but the other man saw nothing. The following day, a message was sent to Anastasios from Marzabanes. The governor had indicated that he had written to the king concerning Anastasios’ case. The governor let the martyr know that the king could be satisfied by one condition: if by word of mouth Anastasios would abjure Christ, after which he could choose whether to be an officer in the royal service or remain a Christian and a monk. He added that Anastasios could adhere to Christ in his heart, but that just once he would have to renounce Him, in words. It could be done privately before two witnesses, “in which case”, he declared, “there could be no harm nor any great injury to his Christ”. The governor’s words fell upon deaf ears. Anastasios answered firmly that he would never dissemble or appear to deny his Christ, and so he said: “May it never be, Christ the King, that I never violate the truth or make a pretense to deny You –no, not in my mind nor thought nor even in a dream”. Marzabanes, perceiving the monk’s adamancy, bound him in chains to two other Christians, and all three were sent to the king. At this juncture, Anastasios was being followed by one of the monks who Abba Justin had dispatched. (The acts of his martyrdom were afterwards recorded by this monk). They were then placed in the municipal prison for three days. Then on the Eve of the Exaltation of the Precious Cross, the 14th September, the saint with his cell mates, together with other Christians (who out of love, when they learned of their plight, came to the prison) conducted an all-night service, which gave all the prisoners great joy. Also, the controller of customs, a pious and God-fearing man, requested of the governor that Anastasios be released into his custody for a few hours, so that he might attend the service the following day in the church, and permission was granted. In the church, when the Christians beheld the martyr in their midst, they were filled with delight and joy. They commended him and reverently kissed his wounds. All this only served to inflame the martyr’s zeal for martyrdom. At the completion of Divine Liturgy, the controller of customs invited the saint to his home that he might offer hospitality and receive the blessing of his presence. So as not to grieve his host, he felt compelled to accept. Therefore Anastasios went in the company of his two fellow-prisoners and athletes; after, they returned rejoicing to the prison. Soon after, Anastasios and his two fellow-prisoners were taken out of Caesarea, followed by a throng of Christ-lovers who were weeping and praying to God to strengthen His athlete. Close by, too was one of the monks that were sent by the elder, who was instructed to assist Anastasios in whatever he might need; he was also to witness and to relate all that occurred to the brotherhood when he returned. The monk followed Anastasios from city to city and observed the local inhabitants coming out to meet and greet him. Anastasios was sorrowed at the honour and respect paid to him and feared it was a result of some sin. Therefore, when Anastasios reached the Tigris River, he decided to write two letters to the Bishop of Hierapolis, asking him if he would make entreaties before the Lord on his behalf for two things: that he might complete the contest for martyrdom favourably and that he not be judged for the temporal honour he received here from pious people. When the holy martyr and his fellow prisoners arrived in Bethsaloe, six miles from Discartha (Dastagerd) in Assyria, near the Euphrates (where the king then was), they were immediately cast into a dungeon. One of the monks, who was following close behind, lodged in the home of a certain Christian, the son of Jesdin, who was pious and loved by Christ. After a few days, Chrosoes made his pleasure known and sent an officer to interrogate the saint. The officer asked the holy captive who and what he was and why he had denied the faith of his fathers. Anastasios did not wish to converse in the Persian tongue, for when he had abandoned the former beliefs and practices of his people, he also left off speaking his native language. Therefore, an interpreter was brought in, and Anastasios, speaking Greek only, replied: “Your religion is the delusion of devils and ushers in a dreaded death. It is by this religion that I, too, was once deceived. However, I fled the darkness and came to the light and now worship the Creator of all things”. The saint continued: “Of His own will was He crucified, that He might redeem us from our sins, for He loves mankind. But you mindless ones worship fire, the moon and the sun”. Anastasios answered: “Do you execute the pleasure without more ado, but I will never deny my Creator and Saviour!” Then, after the Persian manner, he was cruelly beaten with staves; the punishment lasted for three days. On the third day, after the officer made his report to Chosroes, it was commanded that Anastasios be laid on his back and stretched, while a heavy beam was to be laid across his thighs and pressed down by the weight of two men, thereby crushing the flesh to the very bone. The martyr underwent this torture for a considerable time and endured great distress; he was then returned to the dungeon. However, the martyr’s tranquillity and patience astonished the officer, who went again to make his report to Chosroes. It happened that the jailer, also a Christian, gave access to the martyr to everyone that desired to assist him. Therefore, Christians filled the prison to visit Anastasios, including the children of the aforementioned Jesdin. They would fall before the holy martyr’s feet and kiss his bonds, asking his blessing; they would keep as relics whatever had been sanctified by contact with him. The humble Anastasios was sorrowed because he did not want the praise of men, so he strove to hinder them, but could not. The martyr was then ordered beaten with clubs. All observed and marvelled how he courageously persevered under torture, as though he was a stone and not a man. He was then remanded to prison, only to be removed after several days. Once more they attempted to persuade the steadfast martyr to deny his faith by flattering him and then by threatening him with the use of fearful devices. Taken to the torture chamber, they attached a huge rock to one of his feet while he hung by one hand, hoping to break his limbs in this manner. However, by divine assistance, he bravely endured this trial which lasted for two hours. After this, the officer despaired of getting Anastasios to recant, so he had the saint thrown back into the dungeon. The officer left and went to report to Chosroes and to advise the king to discontinue any further attempts, because the prisoner remained unchanged. After hearing the report, Chosroes ordered that Anastasios and all Christian captives should be put to death. Therefore seventy prisoners were removed from their cells and marched to the river. All were to be strangled with a cord, one after another, on the river bank. All were strangled before Anastasios, and when it came to his turn they remarked: “Why do you not do the will of the king, but you prefer to receive such a violent death?” But the saint offered thanks to the Lord for permitting him to die for the love of Him. Then he answered the executioners, saying: “I desired you to cut off my limbs and my flesh into small pieces for my most sweet Master, so that I could receive the most bitter and grievous death. However, you will slay me with a death that is not very painful or evil”. After this they carried out their orders and strangled him. However, afterwards, the executioners struck off the martyr’s head as evidence before Chosroes that they had carried out the slaying. This happened in the year 628 AD, on the 22nd January, during the seventeenth year of the reign of Heraclius. Meanwhile, the jailer desired to take up the relics of the blessed martyr, but the executioners would not permit him. However, the sons of Jesdin, after offering the executioners a sum of money, were told to return secretly at night to take the sacred remains. Therefore the sons of Jesdin and the monk from Anastasios’ monastery (who often ministered to the saint while he was in prison) came by night to take up the martyred body. Behold the miracle: they found the dogs devouring the bodies of the other dead, but the sacred body of the martyr Anastasios did they not even approach! Therefore with great reverence, the Christians took up his relics and laid it in the Monastery of St Sergius, a mile from the place of his triumph. (It is from the name of this monastery that the place was later called Sergiopolis, but is now called Rasapha, in Iraq). The following day, two soldiers of the prison were discussing the events of the previous day. The one remarked to the other: “Yesterday, did you observe how the dogs devoured the bodies of the slain, but they did not approach that monk? Indeed, the dogs sat about it, guarding it!” The other soldier said: “I beheld something even more marvellous; There was a brilliant star, though lower than the other stars that hovered brightly near the earth. I, therefore, went to take a closer look at the phenomenon, only to discover that it was not a star but a light that stood over the body of Anastasios, and I greatly feared!” As the soldiers talked, two imprisoned Christians, who understood Persian, overheard their discussion. Then after the passage of ten days, on the 1st of February, Heraclius’ army arrived. The Emperor, who had personally taken the field, after many brilliant successes against the Persians, almost totally defeated the dreaded Persian enemy. After the martyrdom of Anastasios, Heraclius advanced and occupied Dastagerd, Chosroe’s favourite residence, from which he beat a hasty retreat. Before March was out, Chosroes II, as Anastasios had foretold, had been deposed and slain by order of his son, Kawad Sheroe, who opened peace negotiations with Heraclius. According to their agreement, the Persians returned to the Byzantine Empire the conquered provinces of Syria, Palestine and Egypt, and the relic of the Holy Cross. Finally, the victorious Byzantine Empire dealt the death blow to its constant enemy, leaving the Persian army prostrate. Heraclius returned to his capital in great triumph. Then, on March 21, 630 AD, Heraclius left with his wife Martina for Jerusalem. Upon their entrance into the Holy City, there was much joy, hardly anyone could chant from the great emotion. Heraclius himself was carrying the Cross on his back when, suddenly he could not take another step. Patriarch Zacharias then beheld an angel directing Heraclius to remove his imperial robes and to walk barefoot bearing the Cross. Disclosing the vision to Heraclius, the emperor straightway stripped his raiment and donned poor clothing. Heraclius then restored the Holy Cross to Golgotha, to the joy and consolation of all Christendom, and returned all the church objects, each to its place. He then distributed gifts to all the churches and to the inhabitants of the Holy City. However, as we said, after the death of Chosroes, the two Christian prisoners mentioned above were then released from their bonds. Upon their release, they made their way to Jerusalem, where they proclaimed achievements of the saint and how he had predicted all that came to pass in the Persian land, for the martyr, on the eve of his death, had uttered the following to the two Christian prisoners: “Know this, my brothers, that tomorrow I shall end my course. However, within a few days, you shall be freed by divine help because the unjust Chosroes shall be slain. Then you must go to the Monastery of Abba Anastasios and relate to my elder and all the brethren all that you have seen”. On account of the saint’s true prophecy concerning them, they fulfilled his order and went to Anastasios’ monastery. As for the monk that was sent by Abba Justin to follow Anastasios, after the relics were interred at St Sergius, he brought back the martyr’s mantle. He waited several days, until an expedient time arrived when he could travel safely, although it was evident that the new king was more humane and would not follow the practices of his father. Then, to the monk’s great surprise, he beheld soldiers that were speaking Greek. He saw the soldiers of Heraclius’ army like bright lamps shining in the darkness, and he rejoiced exceedingly. The soldiers asked the monk what he was doing in this strange land, and he explained everything in great detail. Straightaway, the soldiers, with great respect, provided him protection and took him into their camp. Therefore, the monk travelled with the army back to Armenia; from that point, he left to go with a group that was travelling to the Holy City. After almost two year’s time, he arrived safely in his monastery and related to the abbot and the brethren all that has been written above concerning the saint’s courage and martyrdom. At that time, in the monastery, there was a monk who was demon possessed. The abbot then took the mantle of St Anastasios and put it on the demonized monk and instantly he was healed, just as darkness flees at the presence of light, the demon fled the sufferer, unable to bear the holiness of the martyric cassock. Then, in the twentieth year of Heraclius’ reign, the emperor sent a bishop to Persia who brought back the precious relics of the saint to Caesarea in Palestine, leaving only a small remnant behind. Later the saint’s relics were removed to Constantinople, and lastly to Rome. The saint’s head, together with a miraculous icon (reputed to drive out demons and restore the ailing), were then translated and enshrined in the Church of St Vincent in Old Rome. The translation of the saint’s relics is commemorated by the Church on the 24th January. With hymns let us, the faithful, sing Timothy’s praises as Paul’s divine disciple and faithful companion; with him let us also laud Anastasius the godly-wise, who shone forth with splendor like a star out of Persia and doth drive away from us our bodily sickness and spiritual maladies. This presentation article is dedicated to my late grandfather, Anastasios Kroussos, whom was named after this pious and glorious martyr. Another point singling out Anastasios’ martyrdom, is the consistency of the detailed account amongst manuscripts that we have inherited, which demonstrates that his story was not just passed down by numerous sources but by an eyewitness who was there on the ground with Anastasios, living alongside him. The most well known extant manuscript being that of Symeon the Translator begins: “The Holy City of Jerusalem…” Nevertheless other extant manuscripts can be found all over Mt Athos, particularly in the Great Lavra and in the Holy Monastery of Iveron. Nonetheless we also know that Agapios the Cretan had simplified the text of Anastasios’ life and placed it within his collection called the Eklogon. Yet there was no evidence of a service ever having been written for the saint until Fr Gerasimos Micrayannanites composed one. Hence, these were the true factors behind the Islamisation of the Middle East, not through faith or personal conviction, but through discrimination and coercion. Various Muslim commentators assert that half the problems faced within the Islamic world is as of consequence of masses which became Muslims but were not grounded properly within their religion, passing what was cultural custom and not religious tradition on over centuries. If there is an “infidel” one can focus on them and use them as a scapegoat, rather than dealing with and focusing on internal issues central to Islam. However when the “infidel” is annihilated, Muslims then turns against Muslim over the interpretation and application of their faith. Greater Syria: Palestine, Jordan, Syria and Lebanon. Some geographers of the time would occasionally include Mesopotamia (Iraq), but the reference here does not include it, since Northern Iraq was Byzantine territory and Southern Iraq was Persian territory. Hence Iraq was the battleground between the two great powers for centuries until the coming of Arab Muslims, or as the Byzantines and Persians called them “Hagarenes” or “Ishmaelites”. This was due to the fact that many documents and manuscripts, including the Scriptures were written in Greek, and it was in Greek that most people communicated in between differing ethnicities. This is the case with English today which is now an internationally used language in which to conduct business, education and communication, but in those days it was Greek, and thus Anastasios could then be exposed not only to the numerous Christian writings, but also the secular and scholastic writings of his times which monks would be dedicated to studying. That is the order and structure of liturgical services, chanting, Church hymns and the book of Psalms. A particularly important responsibility due to its labour intensive nature, but more so in the fact that like all monasteries, the gardener had to work hard to ensure stable food production to supply the monastic community who were dependent on what they could produce. The Greek text makes a subtle play on words by referring to the trials of Marzabanes, but also inferring the other tyrant being the Devil who is the tyrant of humanity and wishes to destroy and enslave us. Next: 2nd Sunday of Lent, Mark 2: 1-12; Heb 1:10-14, 2:1-3. St Gregory Palmas.